Plans to watch a DVD sent me for review fell through when the DVD was found to be cracked literally in half. I then turned on cable and started watching the recent GODZILLA remake. Since I've had numerous arguments concerning it I decided to hunker down and really watch it since I first saw it in theaters last years. Watching GODZILLA for a second time- I mean sitting down and really watching it a second time as opposed to bouncing through the DVD to the battle scenes or popping in to the cable screenings- I find that the film more than holds up and is just as good as I thought it was when I originally saw it. The arguments against the film have centered in two areas- the first being that we don’t see enough of Godzilla or the mutos. On some level that’s true. We don’t really get good looks at either until the film’s finale- and for me that’s fine. Since the film is focused on the human story and not the monsters how we see or what we see is what people would see. The film opens up at the end only because it kind of has to, partially for dramatic reasons – we need the payoff but also we need the scope to truly grasp what is happening. The other reason people hate the film is that the film is focused not on the big stars but on two seemingly minor characters, Brian Cranston’s son and daughter in law. Many are upset that the characters are a tad bland. I agree that the characters are bland but at the same time they are a tad more real than many other characters in similar movies. I like that the film messes with our expectations as to who the film is about. I like that it kills off two of the big names Cranston and Binoche thus making it clear that no one is safe. What I like about the choice of characters is that by focusing on the Cranston’s son we are given an into being able to follow the action as it transpires. Because of who he is we are given a reason to go to Japan at the start and to be in San Francisco at the end. We are given an emotional attachment to the soldiers in the thick of battle instead of them just being nameless and faceless. We have a stake in what happens. Had the film, as many people argued, been focused on the big picture say Ken Wantanabe and David Strathain and the military operation any asides to the grunts would have been asides. It would have taken away from the greater story. Watching the film again for the first time in a long time it’s clear as beautifully designed the film is . I love how the epic shots are counterpointed by smaller moments. I love how the film never loses sight of the either the big picture nor the small one. It’s an epic summer film that works both big and small. 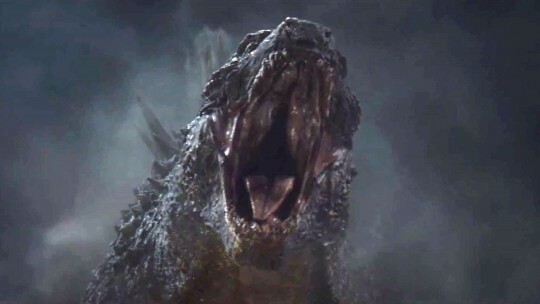 GODZILLA is a truly great film and I’m pretty sure in five years- after we’ve looked back and see the film for what it is and not what we want it to be it will be a hailed as the classic I think it is.